Just wait for it to melt? It wouldn’t surprise me. With big storms like this one is predicted to be, it often takes our township a full two days and sometimes a third to get all the township roads plowed. By then, a bunch of it will have melted. It is snowing here. Not heavy but the flakes are flying. Snow this time of year should melt very quickly. Snowing merrily here just now. Hmmm…way more snow then i expected here (today). Grass is totally covered. Not sticking to concrete surfaces…yet. NWS issued an update…more cold dry air in place the initially they thought…leading to more snow/less rain. Its a winter wonderland outside. Time to turn on the Christmas lights back on. I have potted figs, grapes,and some citrus outside. I guess as long as it does not dip below 32, I will leave them out. My back cannot stand another move in and out. No precip here yet, just fine with me if it stays south. The forecast is still at 13"-26" so I imagine it’s only a matter of time. 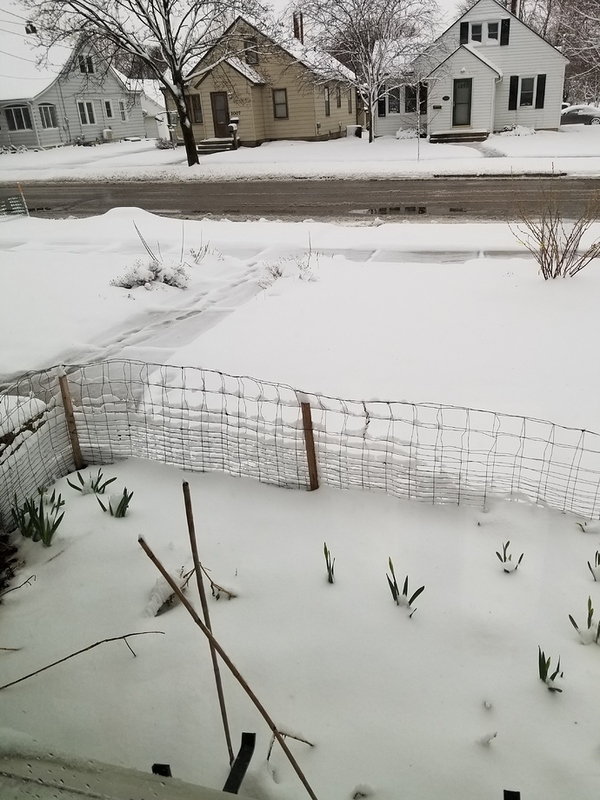 My SIL 4 hours southeast reports blizzard like conditions. I had figured they’d get a bunch of rain down there and very little snow. guess that storm is going to go north of us so we’re looking at only rain. thank God! Sorry, guys… That’s just cray-cray. Was mid 70’s here yesterday and 80s expected tomorrow, and then some rain for the weekend. All this nice weather has me skeptical, as I know what can happen here in April. I even broke out the shorts the last couple days. It really is. The wind is howling right now like crazy and I’m wondering if school is going to be cancelled tomorrow. I was wearing sandals two days ago. You can still wear sandals, just not outside! How much snow are you expecting? I wonder how @Klondike_Mike and @smsmith are doing, they’re supposed to get even more than y’all. Yuck, snow started a few hours ago and weather is predicting 12"-18" at my place and 18"-30" about 30 miles to the south. I really was hoping we were done with snow for the year but winter just won’t let go. JUST STOP IT ALREADY!!! My forecast is 82…going to have to pack ice in the cooler when going to work today. First time this year. Kentucky…along I-75. There’s less than 2-3" on the ground here. The wind is nuts, but the precip has almost totally missed us so far. The forecast is still calling for 9-15" today through tomorrow a.m. so who knows. I wonder how foolish school administrators around here are feeling this morning? They called school off for today by mid-day yesterday. 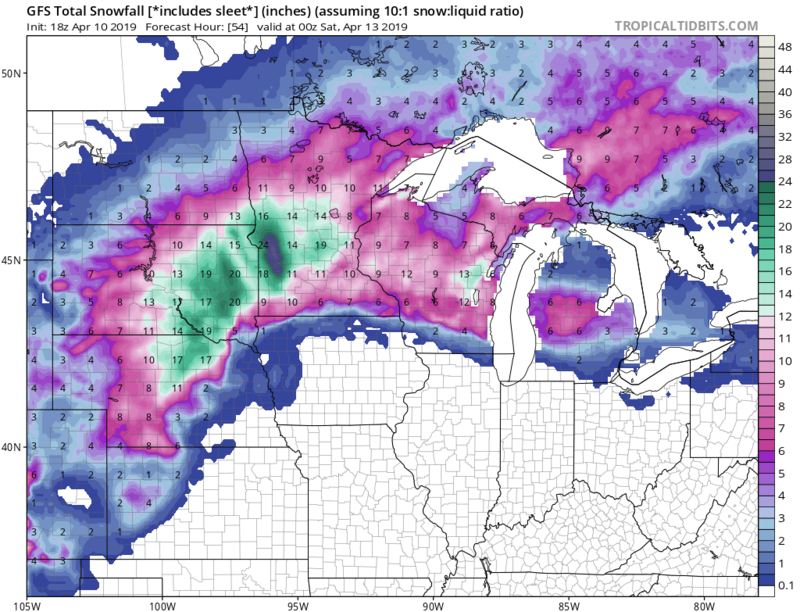 Seems kind of crazy to me to do that based on nothing but weather guessers best guesses. It is the “Day After Tomorrow” out there this morning. Huge bolts of lightning…i saw a power box thing on fire on my drive. Roads were horrible///maybe 3 or 4 inches of sleet type snow. Heavy rain on top of it.